– Location: there is no other place with the charm, history, culture, sea and sun the Nafplio offers in the summer. – 4 individual lessons with a Professor and participation in concerts pending your teacher recommendation. – Supervised practice by Music College students who will be visiting your lesson with the Professor, take notes, and help you to practice in the most productive way to be ready for the next lesson and get the most from your course participation. – There will also be an opportunity to attend lectures on technique and repertoire. – Opportunity to listen to visiting performing artists from different countries. In a friendly and supportive environment, participants of all abilities will be encouraged to tackle solo pieces during the week. The course will end with an informal concert of solo piano pieces. This wonderful, caring, carefully structured programme allows children to work well and productively as well as allows parents to have holidays and enjoy seeing their children explore the world of music and be inspired, because this is exactly what we aim to do! Young people under 18 must be accompanied by a parent, guardian or responsible adult (aged 18 or over). – 2 sessions on vocal accompaniment coaching with Manolis Papasifakis, one of Greece’s most sought-after vocal coaches and accompanists. Manolis is an official accompanist of the Maria Callas Grand Prix competition in Opera, Lied and Oratorio. – Lectures on Technique and Repertoire to broaden your knowledge and to deepen your understanding of music and performance. We are very proud to offer a number of sponsored future concert engagements to follow up the course to successful candidates. Please let us know when you arrive to Nafplio if you wish to be considered for this. Each professor will draw up a short list of potential candidates and the decision will be made by the faculty before the last night of the course. It will be based on the following criteria: talent, potential for a concert career, professional attitude and work ethics. The timetable is carefully organised to give exactly the same teaching and practising time as well as performance opportunities to each student. The students shall experience an intense, but highly supportive, conservatoire atmosphere. There are plenty of opportunities for relaxation too. We can organise excursions to a number of ancient Greek archaeological sites, such as Mycenae and Tiryns. If you stay for a little longer, a day-trip to Olympia is also a possibility, as are the wineries of Nemea. You can enjoy the cafés on the sea promenade and the Greek cuisine in the town’s typical restaurants. We hope you will have a very enjoyable stay and will consider this a Greek holiday as well as an extremely rewarding experience for your playing. – Individual lessons with Susan Bullock, the British soprano who is highly acclaimed performer and visiting Professor at Royal Academy of Music and at the National Opera Studio in London and with Sergei Leiferkus, great Russian baritone with amasing technique. – Opportunity to work with Manolis Papasifakis, one of Greece’s most sought-after vocal coaches and accompanists. Manolis is an official accompanist of the Maria Callas Grand Prix competition in Opera, Lied and Oratorio. We are very proud to offer a number of sponsored future concert engagements to follow up the course to successful candidates. Please let us know when you arrive to Nafplio if you wish to be considered for this. Each professor will draw up a short list of potential candidates and the decision will be made by the faculty before the last night of the course. It will be based on the following criteria: talent, potential for a concert career, professional attitude and work ethics. The timetable is carefully organised to give exactly the same teaching and practising time as well as performance opportunities to each student.The students shall experience an intense, but highly supportive, conservatoire atmosphere. There are plenty of opportunities for relaxation too. We can organise excursions to a number of ancient Greek archaeological sites, such as Mycenae and Tiryns. If you stay for a little longer, a day-trip to Olympia is also a possibility, as are the wineries of Nemea. You can enjoy the cafés on the sea promenade and the Greek cuisine in the town’s typical restaurants. We hope you will have a very enjoyable stay and will consider this a Greek holiday as well as an extremely rewarding experience for your singing. There are plenty of opportunities for relaxation too. We can organise excursions to a number of ancient Greek archaeological sites, such as Mycenae and Tiryns. If you stay for a little longer, a day-trip to Olympia is also a possibility, as are the wineries of Nemea. You can enjoy the cafés on the sea promenade and the Greek cuisine in the town’s typical restaurants. We hope you will have a very enjoyable stay and will consider this a Greek holiday as well as an extremely rewarding experience for your playing and singing. The collaboration of pianists and singers with a string quartet from MOYSA will take place on 25th and 26th of July (please note this is one day extension of the course). You will need to prepare your own part and come ready to rehearse and be coached. The number of places for this collaboration is very limited, so please declare in advance that you are interested and propose your repertoire for this collaboration. 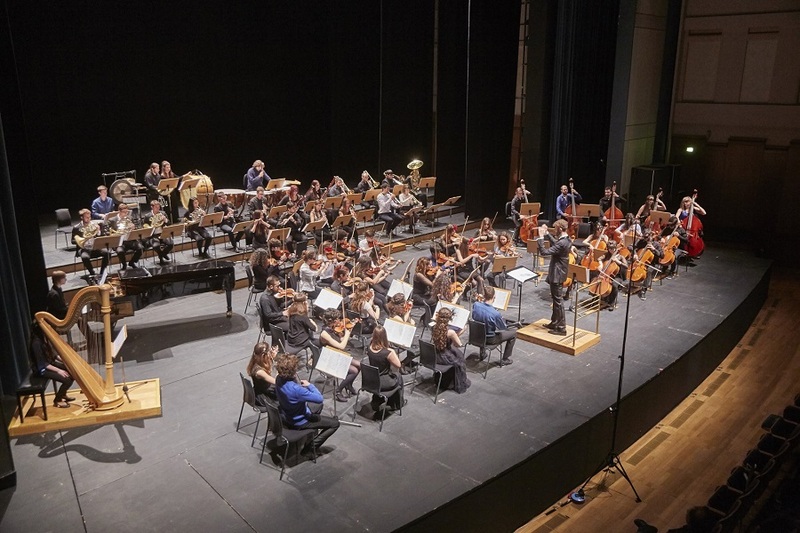 The Megaro Youth Symphony Orchestra – MOYSA was founded by Thessaloniki Concert Hall with the support of Stavros Niarchos Foundation in March 2015. It is a community of young musicians from Thessaloniki, the northern Greece and other regions in the country. Today, the Orchestra counts more than 80 members, from 8 to 25 years old. Its mission is to further educate its members in orchestral art and other related sectors, to support their artistic development via international collaborations and to raise social awareness through music. Auditions for the Orchestra’s foundation took place in March 2015. Due to the unprecedented resonance from young musicians, approximately 250 applications were gathered within a period of just two weeks. The Ensemble first performed in collaboration with European Youth Union on April 19th 2015 in the crowded “Friends of Music Hall” at Thessaloniki Concert Hall, under the music direction of the young, rising Brazilian Conductor, Yuri Azevedo. Since then, the Orchestra has worked with Music Directors including ZoiZeniodi, George Vranos, Daniele Gatti, Dr. Dariusz Mikulski, Vladimiros Symeonidis, Sami Matus, Miltos Logiadis, Michalis Oikonomouetc., with notable Greek and Foreign musicians including Leonidas Kavakos, Vladimir Mendelssohn, BarbaraHendricks, George-Emmanuel Lazaridis, Simos Papanas etc., as well as important orchestras including Prague Symphony Orchestra,Cameristide Teatroal laScala,Royal Concertgebouw Orchestra, European Union Youth Orchestra (EUYO), Thessaloniki State Symphony Orchestra, Athens State Orchestra, Thessaloniki City Symphony Orchestra etc. Within the framework of systematic workshops, MOYSA’s members have been tutored by teachers and instrumentalists of the European Union Youth Orchestra, the Thessaloniki State Symphony Orchestra, and by members of some of the world’s leading chamber music ensembles. Responsible for the Orchestra’s regular preparation is conductor Thodoris Papadimitriou. We accept applications from Music College students aged 18 plus who want to improve their teaching skills as well as knowledge of repertoire and technique. We offer you a free-of-charge access to all Masterclasses, lectures and concerts in return for help with practice for students under 16 years old, 2-3 hours a day. You will have to be present in the student’s lesson, take notes and help the student to achieve their objectives set by their Professor. You will also have a possibility to ask questions and have a discussion with Professors. Places for practice supervisors are very limited, please apply asap. We particularly welcome applications for practice supervisors from Greek students. Please send filled in application form to the following email address: info@musical-odyssey.com.